Settings: Replicator 2 on .3mm/low, as usual. Technical notes, OpenSCAD flavor: Again starting from the parameters and cuboid module from Day 248, the arcade machine is just a cuboid with part of a cylinder taken out of it. We're not really going for realism here, just rough abstract representations. It's interesting to see how simple you can make an object and have it still be recognizable. The light tree is a total hack. 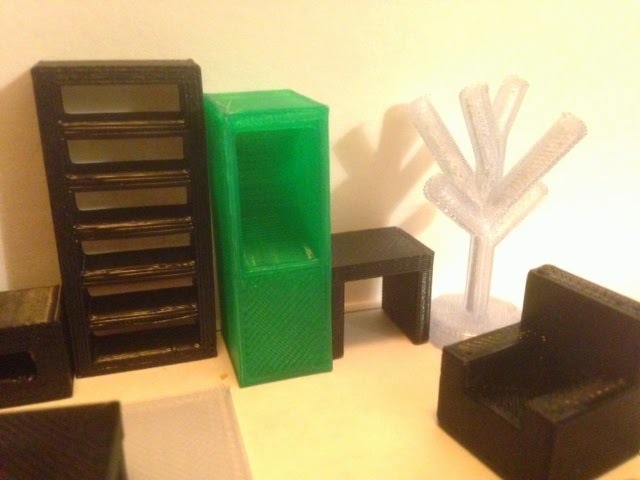 We thought about using the new Customizable Tree on Thingiverse, but we didn't need that much customization and complexity and we wanted to keep all our designs in one simple OpenSCAD document, so we just stuck some angled cylinders to a post to make an abstract tree shape.